From one dirt road to another. Not much to report on this day apart from the 3km climb and the “I cannot be bothered” approach I had for this day. The exciting news is that I’m at the entrance to The Oxley Wild Rivers National Park……back running in the wilderness tomorrow! It’s the days like these that I love the most, but you spend the best part of it feeling anxious. A big days running ahead through the wilderness of the Oxley Wild Rivers National Park, and on opening my eyes this morning I had this anxious feeling. It’s the fear of the unknown, all the usual things run through your head like injury or getting lost, but it’s none of these things that were worrying me this beautiful morning. I had 43 river crossings today and as the guide book pointed out more than once, the rivers can become un-crossable without warning so seek approval before heading out. That said, we had called the contact for rivers two days ahead of schedule, without any answer and no call back. Vickie called the Section Coordinator for this part of the trail only to find out he had gone bush, and his wife letting us know that it “should” be alright as there hadn’t been rain for a while. What I have learn on this adventure is the term “should” SHOULD never be taken gospal what “should” be right, and what is right, are two completely different things when it comes to safety out in the wilderness. So we called Parks NSW. Now Parks in any State can be an interesting one, it goes one of two ways; You get someone who is really helpful and is actually interested in what you are doing and your safety, and then, you guessed it, the complete opposite. Today was that day and I got the same “should" response, “it hasn’t rain around here for a while"! What little I do know about rivers, I do know that they are not always affected by the rain in the immediate area, and if it’s been raining hard upstream, and that could be miles away, then they could be up now or in the next day or two. So, here I am about to head out in to the Oxley Wild Rivers National Park…yes WILD Rivers! Hence the anxiousness! Backpack fully loaded with all the usual gear, plus the possibility of a camp out so all that stuff two, adding to the weight for what was going to be a pretty tough day. I ran down the management track and waved Vickie goodbye, she stood there until I disappeared over the hill, I knew she felt the same way and would have a worrying day watching the SPOT Tracker. The trail left the management track and headed down a very steep spur that my quads didn’t like so early on with the load I was carrying. It was making its way down to the valley floor below which I couldn’t see because of the amazing fog that was lifting out of it, it was like I had my feet in the clouds without the weightlessness. Once at the bottom of the valley floor I was surprised to see it not flat, but just a vastness of more valleys that seemed to go on forever, a trail running wonderland of rivers, forests and valleys, but there was a slight problem in paradise. The Garmin was telling me to take a left down a track that didn’t exists, but the trail I was on was the name of the one I was meant to be turning on to. When things like this happen at the start of a giant day of running, you wonder what you might be getting yourself in to? Gut instinct is what you have to rely on, so I stayed on the track I was on. 2km later it hooked around on to the track I was meant to be on, but there was still no sign of it. It looked like it was going to be one of those days! Sometimes on the Garmin you cannot just follow the purple line that guides you through the bush. Sometimes it doesn’t quit line up with the track you are supposed to be on, it’s not the devices fault, it’s just different to the map I use on the computer. The problem with this happening also is that you can add a fare few km's more before you know it, and this is more than likely why after another hour on the trail, I had only covered a km by Garmins standards! Most of the day would be slightly downhill, so you would like to think of that as being a great opportunity of just cranking out the K’s? Yes, it was downhill in altitude but the terrain was a little something like this. This makes it some tough going with its sharp inclines bringing me to a hike, and then having to make it up on the other side of it by running fast. The valleys where wide and open, full of long native grasses of green, yellow and reds. The seeds would catch on my socks and get stuck under the tongue of my shoes, and after the 10th time of removing a few, I was pissed that I didn’t wear my gaiters. The first 20 river crossings were only knee deep at best, however I was following a brook for the best part, so they should be shallow, isn’t it something like, Brook, Creek, Stream and River?! 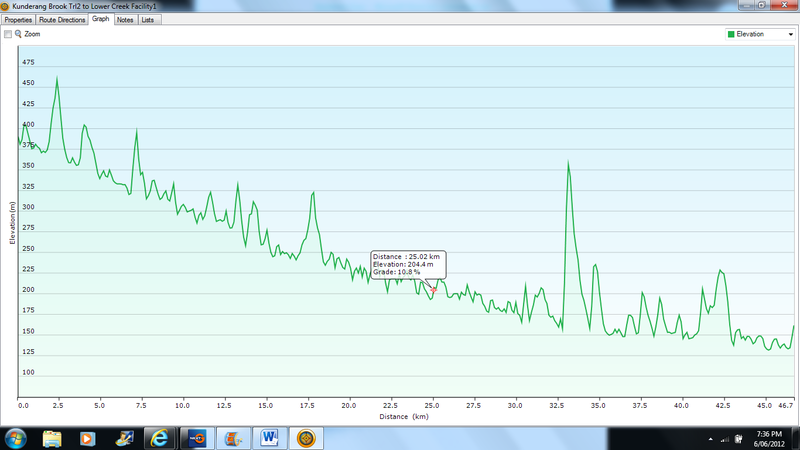 The trail took me up and down for hours with little effect on the Garmin, it had been saying 43km for two hours now. The only reason I knew I was getting anywhere was I was passing landmarks along route. I just needed to keep pushing forwards. I passed the last hut and knew I should only be 27km or so from the finish with the real river crossings coming up. First though I would be passing massacre site and one of the reasons I didn’t want to be stuck out camping the night! A large cloud blackened the sky and it started to spit rain, it was unusual as the sky 360degs around it was blue, it was just dark over my head and I hoped it didn’t follow me to the finishing point! Luckily it was a short stay and I was back knocking off K’s in the sunshine, and I was knocking off K’s too, the Garmin had finally come to the party! The Maclay River was wide at least 150mts. I could imagine that if it was flowing at full bore it would be well up to the pebbled banks I was standing on making it 250mtes of raging river. So, looks like perhaps the “should” theory was right this time! It was hard finding a place to cross it was deep at most places and had a fairly strong pull on it. After a dozen of these crossings and falling in a couple of times, I was now chasing daylight hours. I had a few more crossings and wanted to get them out the way before sunset, where by it would be far more dangerous crossing then, and I would be finding myself camped out here the night. I was pushing hard and hurting trying to wrap up the last 10km and it was difficult running along the river banks having to rock hop and bush bash. The worst crossing came about when it was signed posted! I found myself traveling further downstream to find somewhere safer to cross; the river was deep and wide here! There was nowhere to cross that was lower than waist height, so I took the plunge literally and practically swam to the far side with a panic! This left me with 4km to go. Easy on any school night, but I was cold wet, carrying a heavy pack 68km down for the day and hurting! It was 4:40pm 4km in 20mins should be a cinch normally getting me in just before dark. However the trail disappeared again, like it had done all day and I found myself taking a huge climb. Was I going the right way? I had one finally river crossing 200m from the finish, so climbing up at this stage wasn’t a good sign. Then there was the sign that said “Private Property stick to marked paths” I would if there was one! Then it dropped down steep and I had faith that this should be the final crossing and the Garmin thought so too. Where it wanted me to cross again was a no go, both directions were deep, it was dark now and I just needed to get over. I couldn’t see the Mothership on the far side for scrub, so I yelled out a few ties hoping that Vickie might hear me, there was nothing. So it was one last swim and a grab of the bushes the other side and I was there, just about 10 meters down from where the river had dragged me. Made my way up through the scrub and to the meeting point. Vickie arrived at exactly the same time, funny how that happens. Its frighting to think that these rivers were very low, but still flowing fairly hard and deep. If it had rained more than the day before like it did, I reckon it would have been a whole different experience, but another BNT experience all the same!